This is the time for all things peppermint! These Peppermint Candy Cane Cookies would be great to serve at your holiday parties. Or you can leave some out for Santa. We usually make the Flourless Chocolate Chip Cookies for Santa, but we may switch it up this year. 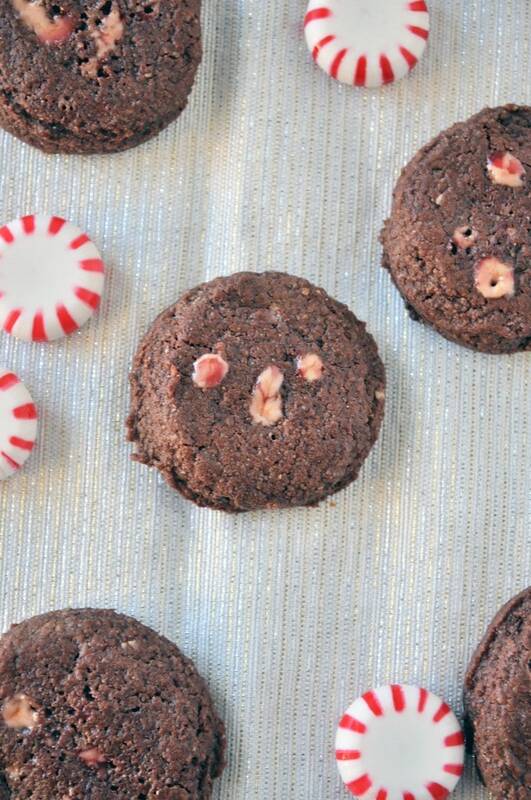 To make these Peppermint Candy Cane Cookies, I slightly tweaked my Chocolate Coffee Cookie recipe. I hope you enjoy them! If you love all things peppermint, you may also like my peppermint fudge. These healthier peppermint cookies are vegan, gluten free and grain free. They also freeze well if you wanted to keep them awhile. 2 dye free candy canes, chopped fine (plus a few extra pieces for the top. In a mixing bowl , mix the coconut butter, maple syrup and peppermint extract. Be careful not to over-mix. Slowly, add the dry ingredients to the wet until all are combined. Lastly. add in the crushed candy canes and mix until combined. Using a small cookie scoop , drop cookies onto a lined baking sheet . Garnish the tops with a few extra candy cane pieces. While the cookies are in the fridge, preheat the oven to 350. Bake the cookies for 10-14 minutes. Store in an airtight container in the pantry for a few days. If you plan on storing longer, you can store them in the fridge or freezer. Enjoy! I love how you've used the candy canes to make 'chips' for these cookies!